(hexahydroxycyclohexane), a cyclic hexatomic alcohol. 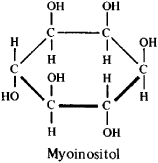 It exists in nine possible stereoisomeric forms, of which only myoinositol (meso-inositol) exhibits vitamin properties. Inositol is a sweet-tasting solid substance with a melting point of 225°–227°C and a molecular weight of 180.2. Readily soluble in water and insoluble in organic solvents, it is widely distributed in plants, generally in the form of phytic acid and its calcium-magnesium salt (Phytin). Inositol is an essential growth factor for certain microorganisms. The human daily requirement of inositol is approximately 1–1.5 g. Like choline, inositol exhibits lipotropic properties; in particular, it prevents adiposis of the liver when there is a protein deficiency in the diet. C6H6(OH)6·2H2O A water-soluble alcohol often grouped with the vitamins; there are nine stereoisomers of hexahydroxycyclohexane, and the only one of biological importance is optically inactive meso-inositol, comprising white crystals, widely distributed in animals and plants; it serves as a growth factor for animals and microorganisms.